At a building owned by the Community Corporation of Santa Monica (CCSM), I conducted a two-part mask making workshop! Families who rented units in the building attended, with children, spouses, and neighbors. Here is this chapter of their story. During the first workshop, participants learned to pound out slabs of air-dry clay, create an “armature” with newspaper to give their masks depth, and form their clay slabs over the armature. The following week, participants used acrylic paints to add color, visual texture, design and pattern to their masks and other clay items, and also enjoyed painting on thick watercolor paper. As acrylic paints dry quickly, and are no longer water-soluble once dry, the artists were able to continue to add paint, details and layers. Reveling in color and brush work, this young artist filled her surface with exploration. I did not see this couple enter the room, and suddenly there they were, painting with complete concentration. Participant interaction makes the whole experience the more rich. Each got their own palette of colors on a Styrofoam plate, with empty plates available for mixing and discovering colors. Green grass with delicate characters above. She must love purple. Maybe she will add it later to her painting! Adding detail. Every brush I brought seemed to have been used! She seems to know exactly what she wants to paint, as if the vision was already inside her head. Energetic color, imagery, brush strokes and composition create movement in this piece. A lion happened on this plate! Painting? Mask? Both?! He said it was his first time painting…he must be a natural. What talent! Many thanks to the marvelous and devoted Rene Melara, programmer extraordinaire, for the opportunity to work with these wonderful participants, and see their artwork blossom. Women share as they create. A seasonal offering sculpted… and painted. https://artissima.wordpress.com/2016/11/08/mask-magic-2/ A Dia De los Muertos sugar scull is created… and comes to life with color and pattern. Color helps to define the mask personalities. Painted plates are another way to create masks and characters. The round shape suggests a lion, and the paint defines it! Color, texture, shapes, and the artists’ choices bring the forms to life. Emotions are elicited through facial expression, color choices, and the way the paint is applied to the textured, sculpted clay surfaces. Strong sense of design and pattern. Proud participating artist with her creations. The fruits of love’s labor. Featured Work: Top 1 Oil: Top Notch Family Affair! Sometimes the many and various elements that go into a project just come together in the most satisfying way. A harmonious yet exciting blending of Client, Designer, and Contractor, other Vendors, subject matter and space can be so gratifying to work with. When everyone respects and supports each other’s process, both creative and business, a project just flows, and is a joy. 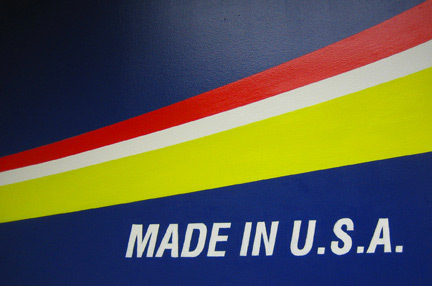 Thus it was with the logo painting project for the new Top 1 Oil office building in San Mateo, Ca. I was brought in and worked in concert with Interior Designer Kelly Berg of Arte Styling, a boutique interior design firm also based in San Mateo. Kelly and I both enjoyed our work with Top 1 Oil, so much so, that I wrote an article about it as one of my monthly columns for the Bay Area Women’s Journal, and Kelly wrote a post about it on her popular Arte Styling Blog. From the responses we received, it seemed that our readers got a kick out of the project as well, and were intrigued with how we “took the company branding to the wall” ! 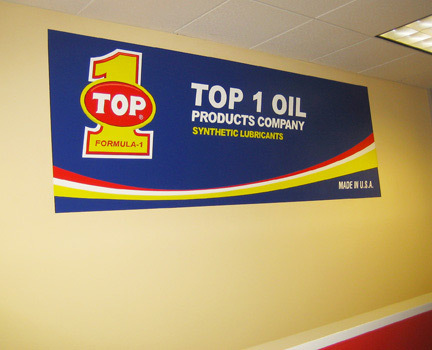 Top 1 Oil, "Taking the Branding to the Wall"! 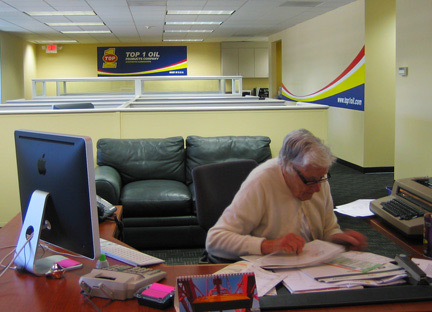 A significant aspect of working with Top 1 Oil was the experience of working with a family-run company. As I understand it, at least three generations of the Ryan family contribute their skills to Top 1 Oil, in areas ranging from finance to sales to publicity to reception, and more! Though I loved working with siblings Mary and Frank, meeting Therese, and interacting with Bridget, I think it was Kate Ryan, pictured below, who really charmed me. Wife of the founder, and mother to many of the Ryans working at the company, Kate is a mainstay of Top 1, and I am sure exerts her charm on everyone who has the pleasure of encountering her at her upstairs office reception post. It was inspiring to meet such a vital lady, who presides not only over the company offices, but also over a multi-generational family of talented participants in Top 1 Oil. Although Top 1 does a great deal of business with clients in Asia and Latin America, in my view, they retain an essential “Americana” approach: hard work, commitment to excellence, and core family values. These are talked about a lot these days, but the Ryans, and Top 1 Oil, actually seem to embody them. Thank you Kate, Top 1, and the Ryan family, for gifting Kelly and myself, and I am sure, all of your other vendors, associates, colleagues and business partners, with a rewarding, authentic, and gratifying experience of committed and creative work. 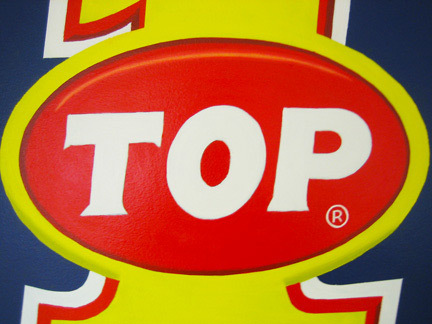 You really are TOPS!